WILLEMSTAD – “To promote knowledge exchange and cooperation between the statistical offices on the islands and the Dutch Central Bureau of Statistics (CBS): that was the purpose of the first CBS Caribbean Conference that was held on February 13 and 14 in Bonaire. The directors and a number of researchers from the statistical offices of the former Netherlands Antilles islands and the Netherlands participated in this conference. The Dutch Caribbean Statistical System (DCSS) was launched during the conference. The DCSS is a collaboration agreement between the statistical offices of the islands and the Dutch CBS. The purpose of this agreement is that the parties will support each other to optimize their statistical systems. The first president of the DCSS is CBS Curacao, but the chairmanship rotates annually. It was the first time since October 10, 2010, that the directors of the statistical offices of the former Netherlands Antilles islands and the Netherlands came together. During the conference, the statistical offices shared their knowledge, among other data sources, processing data and producing statistics on specific topics such as poverty and unemployment. 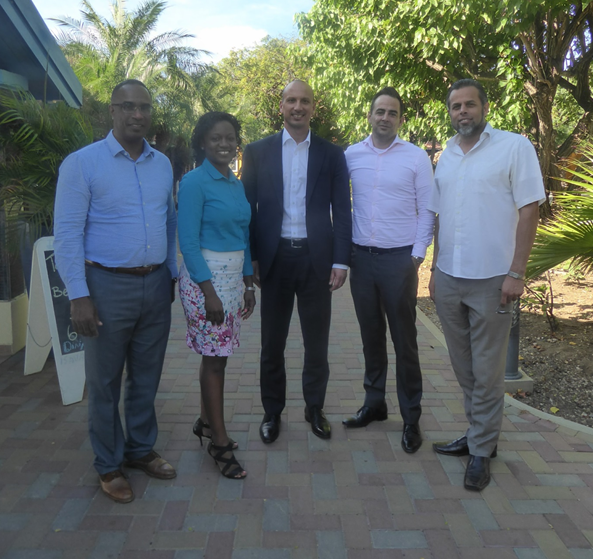 Photo: From left to right: Sean de Boer, director of CBS Curacao, Makini Hickinson, director of STAT Sint Maarten, Tjark Tjin-A-Tsoi, Director-General of the Dutch CBS, Quintin Knuf, manager of the CBS office in Caribbean Netherlands and Marlon Faarup, Director of CBS Aruba.